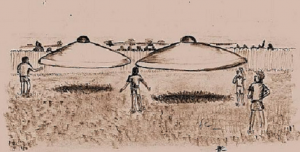 Westall 1966: Australia's Largest Mass UFO Sighting! 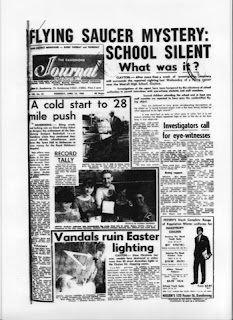 Many Australian's have never heard of it, but above a school in 1966, Westall, Australia encountered it's largest mass UFO sighting. The documentary (which we have written about previously, in 2009) is something all Australians should remember and watch. If any Aussie's have further information on this important event please respond to this post. Photos taken of the event were confiscated from the school teacher by the Australian military! At approximately 11.00 am on Wednesday, 6 April 1966, a class of students and a teacher from Westall High School (now Westall Secondary College) were just completing sports on the main oval when an object, described as being a grey saucer shaped craft with a slight purple hue and being about twice the size of a family car, was alleged to have been seen. Witness descriptions were mixed: Andrew Greenwood, a science teacher, told The Dandenong Journal at the time that he saw a silvery-green disc. Interesting new UFO documentary and good watch. A look at UFO disclosure over the last decade, up until today and where we are heading. Walking to my car. The lights in the sky were blinking. Thought it was an airplane but then noticed there were more lights than normal. 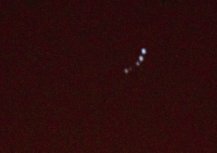 The object hovered in the same position from my viewing location. It appeared to be stationary. I have at least 10 min of footage/photos/ Audio Audio recording of military jet in area. This is not uncommon for my area as they train nearby. I ran to get my camera and tripod to video and called for my other roommates to witness the object. The object then fell from the sky downward and disappeared. I was a Cavalry Scout for 15 years and a trained professional when it comes to identifying aircrafts - I have never witnessed anything like this before From myself to the object was maybe 10k in straight line distance. The size of the object was approx 1 to 2 inches in the sky. you do the math. All I can say is it must have been very long and large in size.